When you begin the search for a digital marketing agency, it can feel like comparing apples to apples. Sure, you can get a sense of a little bit of difference between agencies when you check out their websites, but it’s difficult to really understand what sets any of them apart. You can get a feel for their culture and read their reviews, but you may find a lot of seemingly similar agencies out there to choose from. Once you contact them, you’ll hopefully get a better feel for what they’ve got going on. Why is copywriting in SEO so important? By using a guarantee and making the user feel as if they’re not going to lose out, Highrise held the extremely limited attention of the reader for long enough to get more conversions. If you’re running copywriting A/B tests, the headline is the most impactful place to start. As David Ogilvy said, 80% of people only read the headline. There is an important lesson here, even for the most experienced search and conversion rate experts – the sales funnel consists of many different elements and touch points, making them work together is critical to success. Ok, let’s take a closer look at how you can use SEO copywriting techniques to get more leads, conversions, and sales. You can instantly spot when a blogger has come straight out of college and into the world of writing for attention, not marks: They write steadily, weaving arguments together and only get to the point near the end of the argument. This is great for the academic world, but no good when people have attention spans of a few seconds, and need to be hooked instantly. The idea is simple: You don’t end with the conclusion, you start with it. No one can be bothered to wait around for you to get the point. Saying ‘it works’ is so obvious it’s a truism. It’s become a refined formula over the years, and — if you can use it properly — it proves that long copy sells. The tricky thing about copy is that it seems so simple. When it’s done well, you don’t even notice because you’re focused on the action it wants you to take. When it’s done badly, you don’t even notice because you’ve tuned it out. Let’s look past that and really start to pick apart some search optimized headlines, and why they work. Avoid cannabilization: Ensure title tags are unique to each page, and that only one page on the site is optimized for a given keyword. No stuffing: Do NOT repeat the same word over and over. It will hurt, not help. From the success of this search result for the keyword ‘help desk software’, it shows the two different titles and the two different frame of mind users are in when they’re reading them. The first — from the Google search result — is “Beautifully Simple Help Desk Software”. Zendesk is playing on the misconception that help desk software is ugly and hard to use with this title. The second — from the landing page — is “A better customer experience starts with better help desk software”. This title inserts the keyword elegantly, and promises a benefit — a better experience for your customers. Balancing the benefits of a product against the features is a time-tested copywriting technique. It’s all about finding what works between explaining what your product can do, and what your buyer can get out of it. People have little interest in purchasing a bed. What they want is a good night’s sleep. Basically: People have little interest in having to get an extra piece of software to communicate with customers. What they really want is a better customer experience without the hassle of difficult-to-use software. Write down what usually holds people back from buying your product, agitate the problem in your copy, then sell the benefits. Example: For software that can replace Microsoft Excel, start your headline with something like “Sick of slow spreadsheets?”, for example. Let’s try and find some great examples. The target search term is not bold, negative language leaves a bad taste in your mouth (no pun intended), and it fails to align closely with the search intent – people don’t care about the history, they want to know where they can sink their teeth into a delicious burger right now. A/B test your PPC ads. You’ve got nothing to lose by running tests, and you’re not going to get anywhere near as much insight reading other people’s best practices and trying to apply them. The only person who can find out what works best for your business is you — with experimentation. Here’s how to do it. Listen to Joseph Sugarman. He’s one of the best copywriters of all time, and here’s what he says: Your copy should be a slippery slope. (Source) Your copy should drag readers down the page, enticing them, giving them value, and keeping them from bouncing. “Two tweets about raising money was all it took to get 81 email responses and 53 customer development calls with founders…” *explosion sound effect* If that doesn’t make you go “how the hell did he do that? !”, I don’t know what will. This fantastic opener uses statistics, surprise, and curiosity to deliver an absolute bombshell. It makes the readers ask what the tweets were, who all these people are, and what’s the rest of the story? The title draws people in who feel vulnerable about their ability to raise money, and then the opening line establishes Hiten Shah as a true authority who really knows what he’s doing. After all, Hiten has started three SaaS companies – KISSmetrics, Crazy Egg and Quicksprout. The article also uses storytelling, which is an important copywriting element every human being on the planet can relate to. In fact, it’s in our DNA to enjoy stories and it’s something we’ve been doing since we learned to etch animal drawings into caves in France 30,000 years ago. Use the above checklist a few times when you write your opening sentences. It’ll make sure you hit one of the elements needed to push readers down the slippery slope to your call to action. If you’re giving off the wrong signals in your title and meta description, you’re basically being the burrito shop that doesn’t serve burritos. And you better believe that place has a high bounce rate. The landing page on its own is fine — a classic example that makes no mistakes. The PPC ad that took me there, however… Well, just check the URL. The slug is basecamp-vs-wrike. When I land here, I’d like to at least get one reason that I shouldn’t choose Basecamp! And don’t think I’m trying to distort the truth either, because what I’m showing you above is 100% of the landing page. In my opinion, that’s not how you steal leads off Basecamp. People searching Basecamp are already moving beyond the middle of the funnel. Navigational keywords indicate the searcher has an idea what they want, and why they want it, so they’re not going to fall for a platform that doesn’t attempt to differentiate itself in the slightest. Look over your PPC ads, and this time pretend to be the buyer using the search term you’re targeting. Decide: are they really looking for your landing page, or do you just desperately want to get them there? The same holds true for SEO. Make sure the copy in your title tag and meta description sets an accurate expectation for the user. Otherwise, you’ll see high bounce rates, low dwell times, and give Google a really good reason not to reward your content with good rankings. While the copy isn’t broken up into chunks for readability, you can quickly scan it and realize that you’re just being sold on the same features you wanted when you clicked through on the PPC ad. It’s a technical and specialized product, so it’s written for people who know what they want and optimized for people who search workflow knowing full well what features they’re looking for. The copy under the button is also top notch, because a common limitation with SaaS product free versions is that the features are locked out. Anyone who was unsure about hitting that big green CTA has had their worries put aside. Use the same phrases in your title and body copy as you do in your landing page. Don’t make new offers, put a twist on it, or use generic landing pages for specific copy. Let me tell you… the results of this test are no surprise whatsoever. Variation A tells you what it is you’re clicking on. Variation B, on the other hand, tells you why you should click it, which is much more effective — especially with a call to action to learn more at the end. A good way to implement this to improve your SEO is to ask visitors and searchers to clickthrough to your article in search, and to share it. Both clickthrough rate and social sharing are Google ranking signals. In all of their posts, Mention extracts the key points and then sprinkles ‘click to tweet’ calls to action throughout. Make an A/B test right now for your current landing page, testing your original headline against one of these formulas. The surprisingly low number of formulas found shows that these really are the best (highest converting) headline formulas for landing pages. This increased time on page by 10%, but he wasn’t satisfied yet… Since BuildZoom had started to build a library of remodeling images, they implemented a widget that showed visitors examples of remodeling work in their area. Here’s the amazing part: It rocketed time on page by 150%! The lesson here? You need to keep users engaged with a variety of different visuals. Whether that’s well structured copy, images, or videos, do everything you can to boost time on page and watch the positive impact it has on your SEO. After that quick job’s done, just go ahead and make some edits to your article. Don’t constantly refer to SEO by its acronym, write ‘search engine optimization’ at some point. It’s really easy to just sprinkle these keywords into your finished article and should only take about 5 minutes to squeeze a few in. Let’s take a look now at an article that uses LSI keywords and check the long tail keywords it’s ranking for. In my 2015 blog post I targeted the keyword ‘list building’, but sprinkled LSI keywords throughout, such as ’email list building’, ‘list building strategies’ and ’email marketing’. See what happened? As a result, I managed to scoop up a ton of extra long tail LSI keywords. All of those volume 10 keywords really start to add up. The facts are obvious: numbers in headlines have the highest correlation with preference, preference meaning the gold dust of internet marketing: clicks. People won’t remember vague stuff. What helps people understand new concepts is concrete language. Concreteness is an indispensable component of sticky ideas. Don’t say ‘fast acceleration’, say 0 to 60 mph in 3 seconds. So, remember. To get a reaction from your copy, whether it’s the opening line or a headline, there should be a number in there. Truth is: Humans are now believed to have a shorter attention span than goldfish. And: Every man and their dog knows that in order to make text more readable, it should include images, be broken out into shorter sentences and include easy-to-scan subheadings. So, what’s the big deal? There is nothing inherently wrong with scanning content. I do it all the time. But, remember: Your goal is to engage readers and keep them on your site as long as possible. One of the easiest ways to do this is use subtle visual cues to stop readers while they are in scan mode. Krug recommends using a billboard style design within your content – use language, layout, media and color contrasts to draw the eye, capture attention and stop the reader. In other words: Don’t try and be like Wikipedia, unless you are Wikipedia. Quote boxes provide an easy way to create color contrast, and use influential figures to capture the attention of readers. See what I did there? Rather than just skim over the text, a reader might stop and wait to see where the counter ends. Watching the number grow is a powerful way to quantify value and capture the attention of your readers. Not only do “Action boxes” create another opportunity for color contrast, they imply value. Readers can quickly find the meat inside the post. Now: Don’t get pull quotes confused with block quotes. Pull quotes are short excerpts from the presented text. They are used to pull a text passage out of the reader’s flow and give it a more dominant position in the post or the article. A simple way to break up text and draw the eye of your readers. Takeaway: You don’t need to invest a lot of time building fancy visuals or sourcing quotes from industry experts. Read through your post and see if there is a piece of content that deserves to be highlighted more prominently. Feature it in a pull quote and catch the eye of your readers. Rather than scroll through thousands of words trying to see if there is something of interest in the post, I make it easily for readers to find what they are looking for in seconds. But, here’s the real kicker: You need to get creative with your jump link text. Build excitement or curiosity to compel people to find out more. Check out #23 above (“The Great Pixel Land Rush”), it creates a sense of curiosity. How about #4 below (“How to 4x your email subscribers in under 5 minutes”)? Yes please! You’ve read the article, so now it’s over to you. Step 1: Tweet this article. Step 2: Leave a comment telling me which technique you’re going to implement. Step 3: Go and implement the technique right now. Talk to you in the comments below. To understand what marketers mean by SEO content, it’s helpful to break down the phrase into its component parts: “SEO” refers to search engine optimization or the process of optimizing a website so that people can easily find it via search engines like Google. Articles should be well written, engaging, and informative. They should present a new angle on a specific topic. A good hook at the beginning along with useful information will make people want to continue reading it. Your article should be useful, entertaining, or otherwise valuable. Google search engine provides a great weight on the title of articles and blogs. That is why it is crucial that the keyword phrase is present in the title as an important part of an effective SEO content. This is important so that your publisher can include it in the metadata of the page, which is part of the HTML code. Key phrases and keywords are registered as “spiders,” which are scripts that search engines send out to every page on the Internet. Spiders “crawl” across web pages and websites and analyze them for content and quality of content. One way they do this is by registering the keywords and key phrases to determine the subject of a page; but they also detect how often each keyword or phrases are used, whether a page is grammatically correct, and what types of inbound and outbound hyperlinks there are. Hyperlinks are links to other pages that are somehow relevant to your topic. Your content will rank better as a whole if Google can see it being shared on other sites. Sharing it yourself like in the “Build Links to your Article” step is a great way to start, but making it easy for other people to share can get you even more publicity! Search engine optimization can be defined as “everything you do to improve your visibility in search engines.” But SEO has evolved beyond mere on-page optimization and link building. Once unrelated fields like social media and content marketing have become necessary ingredients for a successful search engine optimization strategy. So, here are nine ideas for improving your visibility in the search engines—on a budget, of course. According to a 2014 survey, nearly 40 percent of SMB websites are built by “myself, a staffer, a friend or family member.” But owning a camera doesn’t make me a professional photographer. Which is why most small businesses are not succeeding with their current site. Making a website look pretty isn’t that difficult. Getting it to perform well in search engines and converting visitors into buyers requires a professional touch. Here’s what you must do to take your site to the next level. I’ve written extensively about why mobile is now mission-critical. Google’s recent move has made it even more so. Checking your site on a smartphone is the obvious answer. If you want a more in-depth analysis, SEO PowerSuite has a handy tool to check if your site is mobile-friendly. Search engines use automated software programs (called bots or spiders) that search the web looking for content. When they find a site, they “crawl” through it, following the links to each page, then add the content to their database. Sometimes these spiders encounter an error that prevents them from successfully crawling the entire site. Unfortunately, unless you “look under the hood,” you’ll never know if these errors are occurring. If you’re a local business, then having your business information listed across the numerous online directories and local search portals is a key factor to getting found online. The more places your business is consistently and accurately listed, the more confident Google and the other search engines can be that your business actually exists and that the information they provide to its users is accurate. In Google’s ideal world, links are earned naturally, simply by creating high-quality, unique content. In reality, all other things being equal, recognizable brands will always outperform small business websites because they attract more links. What’s more, search engines favor brands because their user data tells them people tend to click on brand websites more than non-brands. And as these sites rank better in the search results, people will continue clicking on (and linking to) brand websites more than non-brands. And so the cycle continues. Link building is hard work. But it can be less painful if you start with existing offline relationships, activities and promotions. These can be leveraged into inbound links. For example, a sports chiropractic firm could earn a valuable EDU backlink by sponsoring a university’s annual 5K run. Likewise, hosting local events or a local promotion like a Groupon can generate links. Searching for mentions of your business name online may reveal organizations that have mentioned you on their site, but failed to link back. Ask them to do so. Reviews are another local ranking factor. All things being equal, a business with more reviews will tend to outrank a competitor who has none. Most local search experts believe Google favors Google+ reviews. Google dominates the search market because it’s determined to give its users the best possible experience. That means anything searchers use to make buying decisions will eventually become a factor in Google’s search algorithm. Unfortunately, businesses have been blissfully ignorant about the effect reviews can have. Many have bad reviews on websites they didn’t even know existed. And the only way to offset bad reviews is by getting more positive ones. Welcome to Reputation Marketing 101. Once upon a time, SEO was a purely technical endeavor that involved optimizing the pages of your website and obtaining incoming links. But no longer. Enter “content marketing” into the mix. Professional video production can cost thousands of dollars. For a business on a budget, do-it-yourself video production is your only option. With a smartphone, a few equipment hacks, and a little practice, you, too, can shoot professional-quality videos. Go have some fun. A word of advice: this article is titled, SEO Ideas for Small Businesses on a Budget. For many small businesses, “budget” often codes for “I don’t have any money to spend, so what can I do for free?” Keep in mind that “free” comes with a price—your time. Of all the ideas I’ve presented, setting up a website/blog will be the most time-consuming and requires the most skill. Over the years, I’ve encountered many business owners who thought they could save money by building their own website, only to produce an inferior product, or worse—never getting around to it. Your website is the foundation of your online presence. So my advice is to spend part of your budget to hire a professional. Because, in reality, the only thing more costly than a professional is an amateur. If this seems like a lot of work, you’re right—it is. Which is why marketing firms like us exist. But don’t despair. I’ve structured this article in order of importance. I consider 1 – 6 “mission critical.” (Non-local businesses can skip item 5.) Start with these. If you see an improvement, the others may not be necessary. Depending on the competitiveness of your market, you may have to put in more effort to rank than others. Yes, it takes time, but a year from now, you’ll wish you had started today. Have questions? Post them in the comments below. Onsite SEO involves making sure your website pages, titles, tags, content and overall structure are optimized for your target keywords. You also need to make sure that you have a significant of inbound links from highly respected external websites – that’s called Offsite SEO. Keep in mind that you MUST be using the right keywords or run the risk of spending time and money driving the wrong people to your website. This is a big mistake a lot of clients make before we start working with them. They are optimizing their sites based on the keywords they think people are using, not the keywords people are actually searching. That’s a big mistake. After you know what your keywords should be, you can get started applying your keyword research to your SEO efforts. Onsite SEO is fairly straightforward. After you’ve identified the most relevant keywords for each page of your site and weighted search volume vs. competition/difficulty, it’s time to start crafting your content around those keywords. Once that initial onsite SEO work is completed, there is very little you can do to further optimize your website beyond revisiting and adjusting your keyword strategy on a regular basis. In the meantime, you have to sit back and wait for Google, Yahoo, and Bing to index your site. You can proactively push a sitemap to Google and request indexing (which we do for our clients) but reindexing may take up to 3 months. One way to improve rankings with onsite SEO is to add more pages to your site. This is where blogging comes into play. Every time you publish a new blog post, you are giving your site an new indexable and searchable page. It’s relatively easy to add a blog post, on, say, onsite and offsite search engine optimization. For example: Search Phrase: ‘benefits of bananas’ Keyword (after research): ‘banana health benefits’ Title: ‘10 Amazing health benefits from eating bananas daily’ Description: ‘Eating bananas on a daily basis offers a number of health benefits. Number 3 is amazing and will definitely surprise you! Read on to find out how.’ The H1 Tag: A well-optimized page should have only one H1 tag and several h2,h3 tags. The h1 tag is usually the same as the page title (although it doesn’t have to be exactly the same). A quick way to find out if your page follows this rule is to right click anywhere on your page and select VIEW SOURCE from the pop-up menu. Then click CTRL-F to open the ‘Find’ box and search for H1. if you see more than two instances of <h1> and </h1> then ask your developer to fix it so that the page has only one H1 tag. ALT text for images: If you use images within your text (and you should), you need to make sure that the ALT text has a meaningful value that will give a good indication to search engines about the content of the image and how this is related to your page. For example for the image below, I have set the ALT text to ‘onsite SEO principles’. You can read my previous post on internal linking best practices for more details but as a rule of thumb when you do your onsite SEO review, make sure that your pages have internal links that are useful for the users to see and click. Accessibility: None of the above techniques would be useful if search engines cannot access your website. This is SEO 101 but you need to make sure that you are not accidentally blocking crawlers from accessing your pages. If a lot of sites want to link to your site, then you must have good content. At least that’s what they think. This has been the source of many black-hat SEO tactics in the past. Another way to create quality inbound links and improve offsite SEO is to guest blog. This requires you to reach out to blogs that your prospects are already reading. Not sure which these blogs are? Go to Google and type in “guest blogs” and your “industry”. The result will be a number of blog links for your prospects. If you’re going to leverage this tactic, be sure to always post only truly useful, truly compelling, truly unique content. Now, start reaching out to those editors and offer to write a regular blog post. Most of the editors are thrilled to have industry experts contributing to their blogs. After all, if other people are writing posts that means they don’t have to…You are actually doing them a favor! So it’s not hard to become a guest blogger. Just make sure that your guest blog posts include links back to your site. Do this regularly and you will have an aggressive offsite SEO program that drives traffic to your website. Off-Site SEO refers to actions you can take to promote your website on the web (besides advertising). The most commonly used methods are: Links pointing to your website from other websites. Social media marketing. Link Building: When a user is typing a query in the search box (of search engines), they have to decide which websites to show in the first positions of the SERPS and the order they will show them. 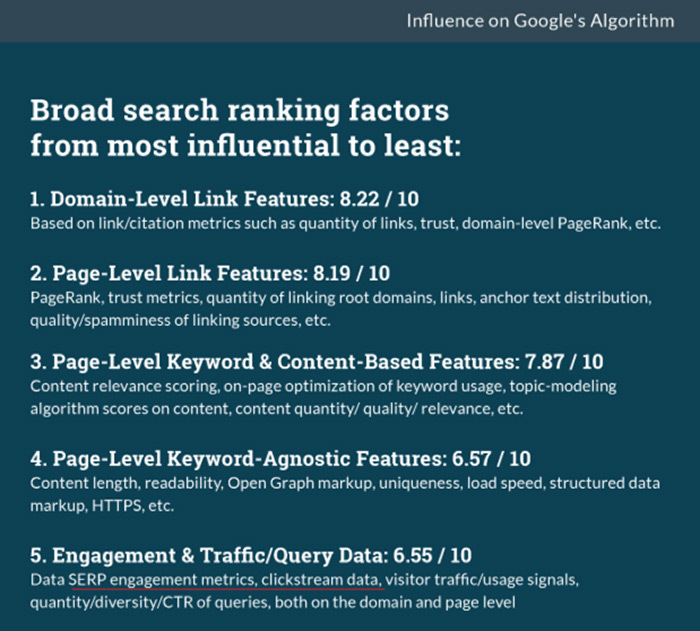 To be able to do that in a way that will keep their users happy about the results, they use a number of factors (Google is using more than 255 ranking factors) in their ranking algorithms. The algorithms are influenced (either positively or negatively) by links pointing to a website. If the links are coming from trusted and related websites, they are considered as a ‘vote of trust’ and they can help a website rank higher. If on the other hand if they are coming from low-quality websites, they can lower the rankings of the particular website or even get it into trouble (think Google penalties). Want to improve your SEO but do not know where to start? Stop Guessing! Read my proven SEO and link building advice and boost your traffic and rankings. Over the years there has been a lot of discussion in the SEO community about natural vs unnatural links, practices that are ‘allowed’ and practices that are considered as a black hat but many people still have questions on how to approach this process. To understand how to use link building correctly, you need to know what Google is saying about links. In summary, Google considers any type of link that was generated for the intention of manipulating their algorithm as unnatural. A lot of unnatural links will eventually lead to a penalty. This means that you should not buy, sell, exchange or ask for links for the purpose of increasing your rankings. What can you safely do? Don’t get into the habit of building links (especially from low-quality sites) but go after natural links. Natural links are given to you by other websites because they found your content and website interesting and worth linking. This may sound weird but it does work much better than spending time and effort to build links that may get you into trouble. Read how my blog traffic increased to 400K per month without doing any link building; this is just one of the examples I can share of my own websites or client websites that rank high and get a lot of Google traffic without doing any sort of link building. You do need links, don’t get me wrong, but you can get them naturally if you have good content and if you can successfully put your content in front of many people. What is the best way to do this? Through content marketing, solid promotion tactics, careful guest posting, and social media marketing. Content marketing can help you publish the right content and good promotion techniques can get your content in front of the right people. Guest posting on sites that matter and have a high Google trust can give you more benefits than building tens of low-quality links. Social Media Marketing: Social media marketing is the fastest way to promote your content to people that may show an interest. It’s not always easy to do, you need a plan and you may have to spend some money but it works and it is safe and solid. I will explain in more details in an upcoming article how to get natural links using the above methods, for the purpose of this post it is important to understand how off-page SEO works and the difference it has with onsite SEO. As explained above you need both. Your first concern is to get your on-page SEO correct so that search engines can understand your content and then when you have enough quality content published on your website you can start thinking about off page SEO and how to get strong natural links from other websites that will further boost your rankings. Don’t start the other way around, if a website doesn’t have all those characteristics to be considered a great website, then it’s not a good candidate for natural links which is another signal to Google that any links pointing to the site are the result of practices that violate their guidelines. Start Today Tip – The first step to any good SEO effort is keyword research. Make sure you are using the right keywords to reach your target audience. Next, take a look at how your site is built. Do you have content built around your primary target keywords? Did your webmaster use the right tags and descriptions when setting up each page? If not, don’t worry…this is a relatively easy fix. Once you’ve taken a close look at your onsite SEO efforts, start an offsite SEO plan. Identify key blogs in your industry and reach out to the editors. Next, create a press release, add links into the release and use one of the wire services to get the release out there. Establish thought leadership and secure guest blogging opportunities on websites where your prospects spend their time. Watch your traffic climb. Do this regularly and you will see your website traffic increase. Then it’s just a matter of time before the leads follow. Are you ready to double your search traffic? Then you’re in the right place. Because today I’m going to show you the exact SEO techniques that I use to generate 151,981 unique visitors per month. Right now, thousands of people are looking for content just like yours. You can help them find it by becoming an SEO expert. According to HubSpot, 80% of a website’s traffic begins with a search query. That’s why search engine optimization (SEO) is so important. The best part? All of these proven strategies are working GREAT in 2018. Let’s do this! And here are the tactics you’ll learn about in this post. Don’t want to scroll? Click a section below to be taken right to it. A while back, Google announced their RankBrain algorithm. And as it turns out, this update was a HUGE game changer. (The other 2 key search engine ranking factors? Links and content). The question is: How do you optimize your site for Google RankBrain? Here are two simple, easy-to-implement tips that are working great for me right now: First, improve your organic click-through-rate (CTR). Google RankBrain wants to see that lots of people are clicking on your site in the search results. That tells Google: “People LOVE this result. Let’s boost it to the top of the page so it’s easier to find”. But if people don’t click on your result? Google will drop your site like a stone. And that’s why optimizing your site for organic CTR is so important. Auditing your website helps you discover why you’re not getting enough search traffic and sales. Many SEO companies offer this service, but you can save a lot of money by doing it yourself. In general terms, auditing is a systematic examination of an event, a result, a concept, or financial books that is done in order to figure out where you stand and how to make smarter decisions in the future. In the SEO world, auditing is a growth hacking technique that will help you attract and retain customers. An SEO audit means you’re closely examining your overall site performance, setting new goals based on what you find, and implementing tactics to reach those goals. This process helps you increase your profits by making the best use of the content you already have. This may not sound like an advanced SEO strategy, but you’d be surprised how many websites are missing basic on-page SEO like page titles or descriptions. It’s easy to overlook when creating your website, but easy to fix with an audit. Here’s what you should be looking for during an audit: Check #1: Do all your website’s pages have SEO meta titles and descriptions? Check #2: Is each page on your website optimized for SEO keywords? Remember, optimize appropriately without keyword stuffing! Check #3: Is your URL structure optimized for search engines? It is important to do your research when looking for long-tailed keywords that will do the trick for your website. Google’s Keyword Planner (which replaced the previous Keyword Tool), allows you to plan which words will work best for your campaigns. If you go to the link above, you will see that you can look at a variety of aspects regarding the keyword. Google does a lot to help you out regarding your keyword research. They offer you a way to look into ad group ideas, keyword ideas, and check the statistics of various keywords and their popularity within Google. Neil Patel offers a variety of tips on his website that show you how to create searches for certain long-tailed keywords. Once you have chosen a keyword, you can also plug it in and let Google’s keyword planner find long-tailed variations for you. Patel, an expert on keyword research and SEO marketing, recommends not being too hung up on Google’s algorithm changes. Instead, he recommends focusing on the main elements of good SEO and keyword use without being overly obsessed with the keywords themselves. Another important tip when it comes to creating a successful long-tailed keyword campaign is to stay relevant to what the searcher is looking for. Of course, you cannot know exactly what they are looking for or who will come to your site. But you should always put yourself in the place of the searcher, just as you try to get in the mind of your customer. Empathy for your client creates a stronger sense of ability to “read their customers’ minds” and every smart entrepreneur and site owner practices this idea as much as possible. It is no different in ranking. When you think like the customer and learn their preferences, you come closer to matching up your products and services with the needs of your client, and that’s what makes good business. Where you do need to remember Google’s latest algorithm changes is when it comes to quality. On January 10, 2018, Google again reminded web owners that high quality is job one and that it supersedes any other factor when it comes to creating quality content. When you produce high-quality content and a stellar website, you are going to outdo many of your competitors who are too busy trying to crank out more content faster than anyone else does. Quality is king and content will continue to be judged based on the amount of value that you bring to your intended audience. Some people refer to this as creating your sales funnel. It is just four different phases that people must go through before making a decision. The Awareness Phase gets the attention of the searcher. The Research phase is when the searcher is researching the topic for further information. In the Decision phase, they decide whether to purchase or not before entering the Purchase phase (the actual purchasing). As a web owner, you should consider which part of the phase your searcher is in. The keywords that you use may vary depending on this factor. It is wise to study this process at length and better still to hire a professional web design company to help you choose effective long-tail keywords to get your site the attention it needs to flourish. At kflseo.com, we know all about web design, and we understand that there is more to web design than only the artistry of the site itself. We can help you choose a strategy for maintaining and marketing your site and give you advice on how to design your site so that it will utilize Google’s standards to the fullest. This will result in higher ranking results. Start with a great site at kflseo.com Because you have to have a website before you can rank. Everybody wants a professional looking website that will help generate more business. But how do you find someone who can create that perfect site for you? Try a search on your favorite search engine (like Yahoo, Google, Dogpile, etc). Be as specific as possible. The best designers are found through word of mouth. If you know someone who has a great website, contact them and ask them who their designer is. Read the description of the websites and click if you are interested.Look at the sample pages they have. If there is nothing you can see from the designer, that should tell you something. Read what the package includes. This is important. Watch out for designers who only charge by the ‘page’. They should be willing to quote on whole jobs. A fee per page can be relatively expensive. Ask about intellectual property ownership of the site. You should be given ownership of the site so that you can update/modify down the track without having to pay the original designer. Make sure any website domain name/address (mycompany.com) is registered in your name with your contact information, not the web designer. This will ensure you can still use your website domain name in the future, even if you take your business elsewhere in the future. If you are planning regular updates and cannot afford to employ someone to do them for you, ask to have the site designed to an easily-editable template. This may cost more initially, but should allow a novice to update the content easily. Never pay for extra services such as ‘search engine placement’ that you can get for free by registering at Google, Yahoo and MSN directly. Always read the fine print before you sign up. Some companies that seem professional and trustworthy may have terms of service agreements that would surprise you. Take the time to know what the restrictions are, what they guarantee, and what they don’t. It doesn’t matter if your company is big or small, a bootstrapped startup or a Fortune 500 firm — you need SEO to maximize your e-commerce website’s profitability. The tips I’ll share in this report are based on 10+ years of hands-on, real-world experience with SEO and e-commerce. Each recommendation is based on analysis of hard data, not intuition or gut instinct. These hard-earned lessons come from helping real clients with genuine situations. Search engine optimization delivers results that are targeted, cost-effective and measurable — and long-lasting. SEO doesn’t have a shelf life of weeks or months. No one “pulls the plug” on SEO. With paid advertising, the minute you stop paying, the traffic drops. SEO just keeps going and going, working night and day. The long-term effects of a solid SEO program are clear. Unlike most forms of marketing, where you start with a clean slate every year, SEO builds upon itself to grow stronger over time. You can layer upon what you did last year and keep growing until you own your niche and dominate your market. In some cases, you can even take a break or focus on other things for a few weeks or months and return to find your SEO just as effective as before (or close to it). Unlike paid advertising, the stream of customers and sales won’t stop the moment you put the brakes on. If you run short of cash, you could pause your other ads and still be visible to your audience through organic search results. Having an e-commerce website without SEO is leaving cash on the table — and plenty of it. But don’t take my word for it. Log on to your analytics tool. Look at where most of your traffic, conversions, and sales come from. I’m positive that, in most cases, organic search will rank as one of your top sources of revenue. For many businesses, Google drives the lion’s share of profit-producing traffic. (And if it doesn’t for yours, then you’re making some big mistakes somewhere.) The way technology has evolved over the years has transformed the way consumers purchase products. Search is now an integral part of the decision-making process, with 89 percent of consumers using search engines to inform their purchase decisions. Thus, ignoring SEO means you’re taking the risk of not being visible during your customers’ buying journey. When you aren’t visible on search results, fewer customers know about you, you sell less, and your growth slows down. At the same time, your competitors will increase sales and profits — and you’re letting them grow stronger. Look at it from another perspective. Your potential for growth is tremendous. Too often, I find clients satisfied with average rankings on Google’s organic search results. They don’t understand that they could expand sales and revenue massively by improving further. If your revenue were to drop by 50 percent, alarm bells would go off instantly — yet that doesn’t happen when you miss a chance to grow by 50 percent. That opportunity is just waiting there for you to grab with a superior SEO strategy. My more successful clients allocate most of their time and resources to activities that are essential for meeting their goals — and cut down on areas with lesser potential or impact. When the fundamentals of your sales and marketing strategy involve correct analysis of your situation, market and competition, and your plan is tailored to your resources and strengths, your efforts will be more cost-effective. In highly competitive industries and niches, paying for website traffic can run to many dollars per click. Or maybe you’re forced to buy costly banner ads. With effective SEO, you are less dependent on this traffic. Of course, you can still buy ads. But if finances are tight, SEO can be a lifesaver that keeps sales and profit flowing. Unlike paid search traffic, the traffic from organic search is “free” — no cost per click, no cost per conversion, no cost per impression. No wonder SEO has always been so popular. You can attract quality traffic in large volumes without paying for it directly. (Of course, there are costs associated with hiring and retaining an SEO professional, though this is true for any online marketing discipline.) Successful e-commerce companies have prioritized SEO efforts to optimize their websites for Google (and other search engines). I’ve seen small Norwegian local e-commerce websites dominate niches with stiff competition from leading international brands. Remarkably, they do this even with relatively small budgets and limited resources. Some have done it just by following simple SEO best practices. These successful companies have a unique mindset. Their approach, preparation, and planning are different. They integrate SEO with an overall marketing strategy, tying it in with activities like content marketing and social media marketing, guided by an experienced SEO consultant. Integrating SEO with other marketing activities has a twofold benefit: it increases the effectiveness of these marketing activities while also improving your organic search visibility. This saves you time and money and brings down your cost per conversion. You’ll achieve more by spending less. There are many reasons you should optimize your site for search engines, but the bottom line is to increase sales. When SEO is done right, you will see an increase in quality traffic, which will lead to more conversions and repeat visitors. Before you get started, understand this: SEO work isn’t a one-time deal. Google and the other major search engines are updating their algorithms constantly in order to bring the best results to searchers. Because of this, you’ll need to stay on top of the updates and adjust your strategy accordingly. There is no doubt that SEO work requires a lot of time and dedication, but the benefits are worth it, and I hope that this guide helps you get your SEO strategy in place to boost your sales from your e-commerce site! We know many of our readers want to know how to optimize your site better to get the best results in the search engines. While there is no exact method for increasing your SEO or one “magic bullet” that makes everything fall into place, there are some basic tips that we can offer that will increase your credibility with the search engines and ranking. Rankings are important, but they are not everything. One site that focuses on SEO advised site owners not to obsess over SEO but instead to pay attention to high quality, original content that draws people and engages them. Here are seven tips that may help you as you work on optimizing your site for the search engines that focus on people rather than keywords but still includes them as a method to increase your traffic. But remember that increasing general traffic doesn’t increase conversions. You need to focus on increasing targeted traffic instead. We hope these ten ideas will help you to focus your efforts where they will do the best. 1. SEO Audit Knowing where you are is crucial to getting to where you need to go. Take a moment to understand what is keeping you from ranking high on search engines. 2. Keyword Research Researching a good keyword option can mean the difference between success and failure. Be certain to choose a keyword that is searched frequently, but has little competition. 3. Change Existing Pages Now that you have your keywords set, it is time to make certain your existing content is lining up with your SEO objectives. Don’t underestimate the power of this step. 4. Check Technical SEO Aspects When Google scans your website, it is not just searching for the words that user see, it is also looking for other information, called metadata. Make sure Google is seeing the right metadata. 5. Link Building In addition to blogging, it is important to get links to your website. Google views links to your site like a vote from the online public that says, “this company is legit.” 6.Blog Around Keyword Once you have your keywords set and your website content is SEO friendly, it is time to look at your log. Every campaign should have at least one blog post per campaign keyword. 7. Social Media Marketing Once you have SEO friendly web pages, blog, posts, and links to your website, it is time to promote all three on social media. Content is not much good without an audience. Well, there you have it: seven tips that should help you to maximize your impact on your website and in the search engines. If you follow these methods, you should have a good start on how to increase your impact on the web. There are many others we could have included, and the list is not exclusive. The key is to find what works for your site and always adhere to the basic principles and ethics that Google has recommended for web promotion. Step-by-Step Guide on How to Create a Successful Facebook Fan Page Facebook Fan Pages are a great way to increase your customer interaction level and get more people to connect with your brand. Facebook has some great tools for businesses to maximize their presence on their social media platform. One of these great tools for businesses is the Facebook Fan Page. Facebook is one the best ways to improve your brand’s presence on the web and engage and delight customers. Facebook statistics show that the number of users on Facebook have reached 1.71 billion in the second quarter of 2016. If you do not have a Facebook fan page, you are missing out on a potentially large number of customers and leaving money on the table. So, let’s dive into how to create a Facebook Business Page. Follow these steps and you’ll have your Page up and running by end of day. To create a Facebook fan page, follow these steps: 1. Start by signing into Facebook and creating a Page. Go to facebook.com/business and click Create a Page in the top right hand corner. You’ll be greeted with several business type options including local business or place, brand or product, and cause or community. Select the type of business you’re creating the Facebook Page for. If your business type falls into more than one of the category options, choose the one your customers are most likely to think of when they think about your business. 2. Create a stunning timeline and profile photo. Your timeline photo is crucial to the impression others have of your brand on Facebook. It should be something that will be appealing to your target audience, and that will have a professional look and appeal. On a Facebook fan page, your timeline photo represents your brand so choose carefully which image you will use to represent your company. Many businesses use some activity or event that they are involved in to achieve this. Your profile photo can be your logo or anything else that people will associate with your business. 3. Focus on the About Info. After you have uploaded your timeline photo, you will want to add the About info. This part is also important because it is information that you will use to tell people about who you are, what your purpose is, and how you can help them. This section is now located right under your cover photo. 4. Include mobile apps. With everyone going “mobile,” it’s important to be mobile friendly on Facebook. The app section is included in Facebook fan pages, and it is located in a column to the left of your fan page. You are allowed spaces for up to 10 apps. 5. Create a status update. To create a status update, simply click on the text box under the pencil that says, “status,” and you can make a new post. To start, it is recommended that you focus on posts that summarize what your brand is about so that people will get to know about your company and what you offer them. Once you have established your bearings, you can also post things about specials, events, or other aspects of your business that will appeal to more people. 6. Pin to the Top. One of the best features of a Facebook fan page is that you can pin a particular post to the top of your newsfeed. This allows people to see this post first when they first come across your page. It is recommended that you post particularly engaging content such as videos and photos that illustrate your business closer to the top. Also, recent events or upcoming activities should be displayed on top. 7. Gathering Leads and Followers. One of the best aspects of a Facebook fan page is that you can create leads and gain more followers. These fans can turn into customers and brand ambassadors and help you spread the word about your brand. By using customized Facebook ads and other tools available on Facebook, you can increase your impact with your fan page and grow your business. People love seeing video and media on your Facebook. They also tend to share posts with video and other media more often than those with only text. Studies show they are far more engaged with photos and video than will text alone. Posts with only text do not convert as well. So try to include pictures and video whenever you can to increase your level of engagement. Now that you’ve got the basics of how to setup a Facebook Business Page in place, it’s time to think about ways to optimize your Page to maximize engagement and meet your Facebook marketing goals. Here’s a quick video overview of the steps you can take to optimize your Facebook Business Page. We’ll dig into these components in more detail below. Once your Facebook Page is set up and optimized, check out our full guide to marketing on Facebook to take your Facebook strategy to the next level. Now that you’ve set up your Facebook Page (and optimized it), manage your Facebook presence by using Hootsuite to schedule posts, share video, engage with followers, and measure the impact of your efforts. Try it free today.